I am always interested in having motivated graduate students join my research group. 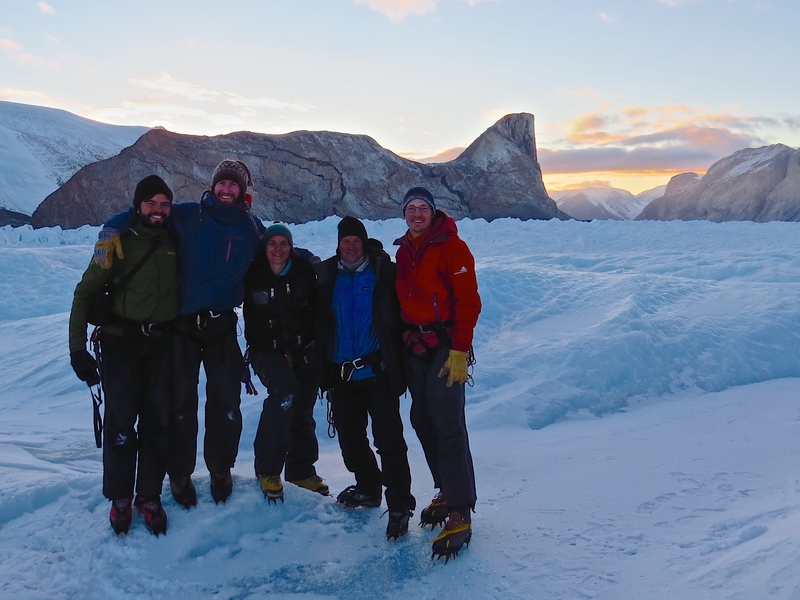 Our 2015 Greenland field team at the successful completion of our fieldwork. My research group at the University of Idaho works to understand the processes that control glacier and ice sheet motion and mass loss. Tidewater glacier dynamics, glacier hydrology, and glacier seismicity are particular focuses of our ongoing research. We draw on our knowledge of physical, glaciological processes and a variety of field-based and remote sensing methods to better understand how glaciers work. Students will be supported (tuition, fees and stipend) via a Research and/or Teaching Assistantship. The successful applicant will have the opportunity to work with a variety of exciting new data sets, such as seismic or terrestrial radar data, that offer high resolution views of glacier processes. Projects working with satellite or airborne data quantify glacier processes at broad spatial scales. Brief summaries of potential projects with data from Greenland and Alaska are below. In addition, group members will have the opportunity to participate in glaciological field work at glaciers on the Cascade Range volcanoes or within the northern Rocky Mountains, sites all within several hours drive of the University in Moscow, Idaho. 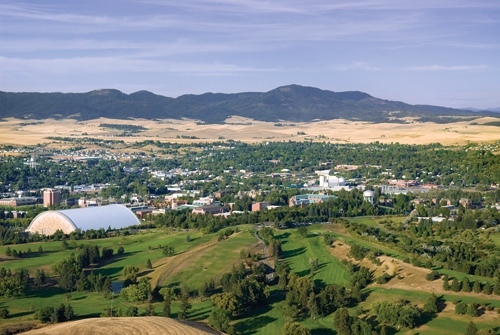 The University of Idaho campus with Moscow Mountain, a foothill of the Northern Rockies, in the background. Students working in our group have the opportunity to receive degrees in the Department of Geological Sciences, Geography, or an interdisciplinary program such as Water Resources. Faculty at UI have existing strengths in geophysics, climate science, Earth surface processes, remote sensing, and spatial analysis and statistics. Incoming students will join approximately 40 other graduate students working on Earth science questions in the Departments of Geography and Geology. Moscow, ID, is in the Idaho panhandle, between the foothills of the Rocky Mountains and the beautiful Palouse hills. Moscow is a great, small town, with a vibrant, walkable, main street and is quite affordable (monthly rents for 2 bedroom apts near campus are ~$500). Students and other Moscow residents enjoy a wide range of outdoor activities that are all within striking distance for day, weekend and longer trips. Prospective students with strong quantitative backgrounds and coursework in math, physics, geology and/or geography will be well prepared. Scientific computing is a valuable tool for all our research and experience with programming languages such as Matlab, Python, or R will be a significant help, but is not required. We actively seek members from a diversity of backgrounds, particularly those underrepresented in the sciences. Applicants should email Tim with a short expression of interest and overview of their background to discuss opportunities. Learn more about applying to the UI Department of Geological Sciences here. This NSF funded project will draw on a wide variety of remotely sensed imagery, oceanographic data, and timelapse photography to evaluate terminus boundary conditions (calving laws) used by ice flow models. These calving laws predict terminus positions and calving rates around the ice sheet. Increases in calving and submarine melt rates at the marine termini of Greenland’s tidewater outlet glaciers lead to the most rapid rates of ice loss from around the ice sheet, and therefore to acceleration in the rate of sea level rise. Outcomes from this project will be two-fold: 1) New, mechanistic understanding of the drivers of terminus ice loss in the diversity of settings around Greenland; and 2) Model improvements in the handling of calving, thus directly leading to improved predictions of ice sheet change and sea level rise. Water flow beneath glaciers plays a critical role in setting the speed of ice flow. When ice flow speed increases, it arrives at the ocean and lower elevations more quickly, where calving and melting raises sea level. Passive observations of seismic noise produced by flowing water at glacier beds, termed glaciohydraulic tremor, represent a new way to study this water flow. The graduate student researcher will have an opportunity to work with seismic data from networks established near and on two glaciers in Alaska to study glaciohydraulic tremor signals in detail. Through new analyses, the source of these signals will be identified, with a particular aim to identifying changes in the source location. Seismic analyses can be supported by weather station, remote sensing, and ice surface motion data. The outcome of this project will be a mechanistic understanding of the evolution of subglacial drainage systems. Increases and decreases in the rate of flow of tidewater glaciers are a major contributor to sea level rise. The present poor understanding of tidewater glacier flow speeds in Greenland and elsewhere is a significant source of uncertainty in forecasts of sea level rise. For this project, the graduate student researcher will draw on novel terrestrial radar interferometric data to map glacier velocities and elevation changes at Greenland outlet glaciers with temporal (minutes to hours) and spatial resolution (~100 m) that was unheard of even 5 years ago. Through comparison between these data products, tidal models and nearby seismic and weather data, the student researcher will arrive at an improved understanding of the basal conditions beneath glacier outlets and the factors controlling hourly to weekly variations in glacier flow.